Chicken breast stuffed with chorizo served with a red pepper and tomato caponata. For the chicken: cut the chorizo slices in half. Gently lift the skin from the chicken breast to create a small pocket. Place the chorizo slices into these pockets. Heat a frying pan and add a little olive oil. Place the chicken in the pan skin-side down and cook until golden brown. Turn over and cook for a further 2 minutes. Remove from the pan, place on a baking tray and finish cooking in the oven for 6-7 minutes. For the sweet pepper caponata: peel and dice the red peppers. Peel and finely slice the spring onion. Peel and dice the tomatoes. Fry the pepper with the spring onion in a frying pan with half of the olive oil. Add the garlic (skin on) and the thyme. Season with salt and pepper. Cook for 3 minutes then add the tomatoes. Cook for a further 2-3 minutes then add the sundried tomato paste. Remove the thyme and the garlic and check the seasoning. 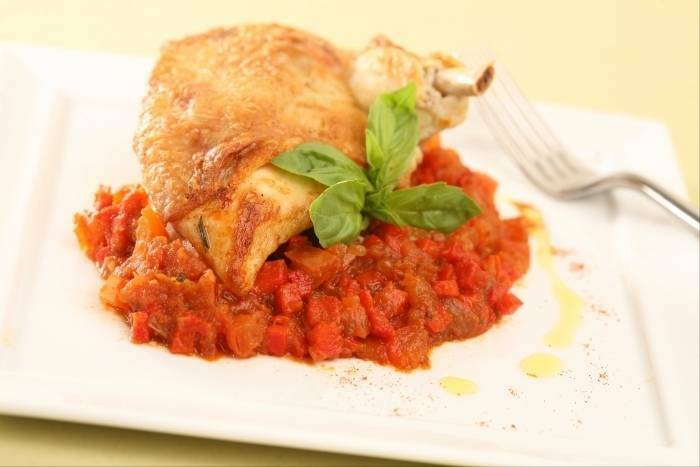 Serve the caponata in the centre of large dinner plates and place the chicken on top.